Sometimes things just line up. That’s clearly what happened in 2007, when moviegoers were improbably treated to a calendar year full of undeniable excellence on screen. Some of these great films were recognized almost immediately, others have gradually garnered appreciation over time; but as we stand ten years later, 2007 remains one of the standout years for movies over the last few decades. Throughout 2017 I’ll be periodically going back to take stock of what made these movies so impressive and how they hold up today. Unlike No Country for Old Men or There Will Be Blood, two masterpieces from 2007, Michael Clayton did not challenge or redefine cinema as we know it. However, it did make many adult moviegoers relieved that films like this could still get made. By that I mean grown-up, restrained genre thrillers. Michael Clayton is made with such confidence and directness that it is out of place among today’s crime/legal/political thrillers that go for cheap adrenaline rushes and sloppily-asserted “messages”. You might have to go back to 1999’s The Insider to find a comparable film with as much intelligence and self-assurance. The script here, written by director Tony Gilroy, is tightly-constructed, non-linear, and avoids obvious cliches. Gilroy had written all three Bourne movies by this time (he would write-direct a fourth in 2012), so clearly he had the chops to put together a compelling action flick. This was his first directorial gig though, so it’s not like this was going to be a slam dunk. Denzel apparently turned down George Clooney’s role because of his hesitance at working with a first-time director. What Gilroy brings besides his excellent writing is some decent visuals filmed in a mostly classical style. Nothing too flashy with the camerawork like the Bourne flicks, which mostly works for this type of film. You can tell Gilroy doesn’t necessarily have the eye for a telling shot like some of the greats working today, but his writing more than makes up for it. He does have help, though. 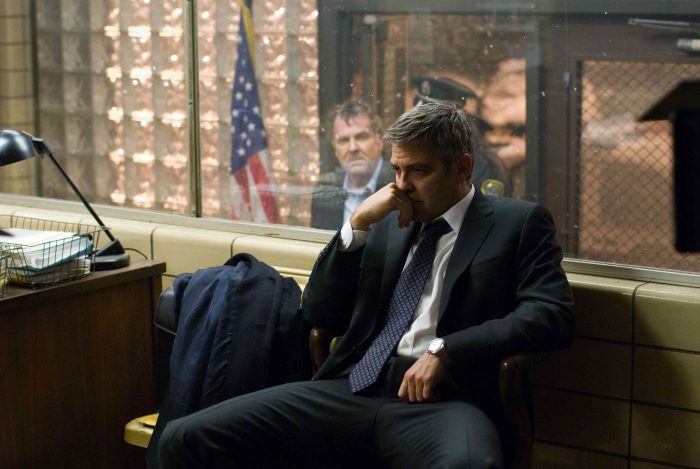 Clooney is excellent, cool and suave like Danny Ocean, but with an undercurrent of frustration and paranoia. As stellar a career as he’s had, you could make the argument this is his best work (I don’t know if I’d necessarily make that argument, but you could). Playing the titular character, his “fixer” works for a high-powered law firm in New York. He’s brought in to clean up the mess made by Tom Wilkinson’s Arthur Edens, a defense lawyer whose bipolar condition causes him to act irrational and paranoid while working on a case for a shady chemical company. Wilkinson, all wild-eyed and unstable, usually isn’t given roles where he can go this gonzo. He relishes it, as does Tilda Swinton, who plays a legal representative of the aforementioned shady company. She won the Supporting Actress Oscar for her work here in an understated, far from showy performance. There are a handful of really gripping scenes where the actors just continually raise the bar for each other. Wilkinson and Clooney in the alley and then Clooney and Swinton at the close of the film come to mind. Acting and dialogue meshing wonderfully, with themes of paranoia and corporate corruption revealing an outraged worldview that doesn’t resort to heavy-handedness. It’s righteous anger that doesn’t need to shout. 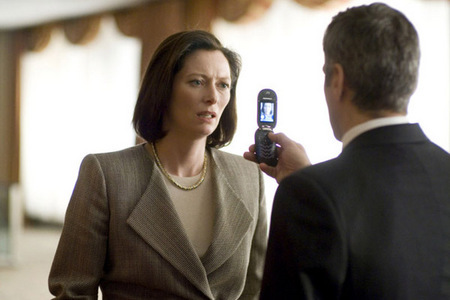 Of course, a year or so after Michael Clayton‘s release, we had the subprime mortgage crisis in the U.S., with corporate negligence and greed contributing to the Great Recession. In the end, Clayton nails the chemical company for manufacturing a weed killer it knew to be carcinogenic. If this movie had come out a couple years later than it did something tells me it might have made more money at the box office. Critics gushed over it, nonetheless. In a stacked year, it made numerous end-of-year top ten lists. They compared it to classic 1970s and 80s legal thrillers, where the style never casts a shadow over the substance, like All the President’s Men and The Verdict. Those are apt comparisons, because the restraint in visual style and pacing is what sets Michael Clayton apart. In the decade since, Tony Gilroy has only enhanced his reputation as an intelligent Hollywood screenwriter, although his two directorial efforts since (Duplicity and The Bourne Legacy) have fallen short of Michael Clayton‘s heights. Gilroy has a remarkable ear for killer dialogue, but not necessarily overt visual panache, which, like I said, doesn’t hurt this film at all. If there was a sigh of relief that smart, medium-budget thrillers like this could still get made back in 2007, it would be an even heavier exhale today, as comic book movies and sequels crowd out the Michael Claytons from even getting greenlit. More and more, understated prestige dramas can be found on TV (The Americans, The Night Manager) instead of at the movie theater. It’s certainly not easy to create something as compelling as Michael Clayton, but the lack of similar films in recent years is disheartening. Increasingly, if your movie isn’t an already recognizable franchise or can’t immediately generate discussion/controversy, it might never see the light of day. Michael Clayton was a grower for me. I enjoyed the first watch, but only on the second did its excellence become obvious to me. Due to its patient, slow burn nature, it’s simply working on a higher level from the vast majority of political and legal thrillers. Pour one out with me for all the Michael Claytons that never made it to the screen. With your permission, I’d like to use a quote or two from your post. I normally program movies from the classic Hollywood era, but I feel so strongly about this movie that I had to include it. Sure, go ahead! I hope the showing goes well. This movie has been criminally underseen.